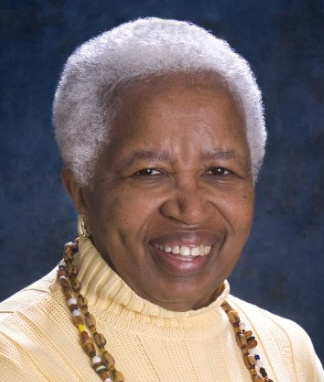 Jeannette Brown, a retired organic medicinal chemist, was one of the many authors of the short biographies that have been selected for publication in the new series of books African American National Biography, recently published by Oxford University Press. 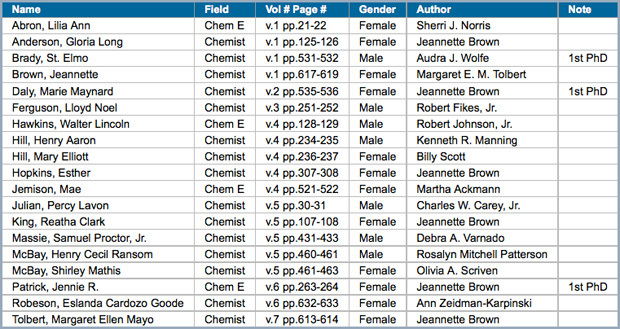 The eight volume set of books published in February 2008 contains biographies of only nineteen chemists and chemical engineers, twelve female and seven male. Ms Brown contributed the biographies of six women chemists and chemical engineers, including Dr. Marie Daly, the first African American woman to receive a PhD in chemistry and Jennie Patrick, the first African American woman to receive a PhD in chemical engineering. 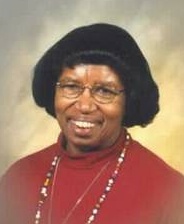 Dr. Daly was Ms Brown’s inspiration for becoming a historian of African American women chemists. Ms Brown met Dr. Daly at a local American Chemical Society meeting and realized that she was talking to a person whose story needed to be told. Dr. Daly was on the research team of Alfrey and Mirsky at Rockefeller Institute (now University) and worked on discovering the amino acid precursors to the discovery of DNA. The work of this research team was mentioned by Dr. James Watson in his Nobel Prize lecture. Dr. Jennie Patrick had to overcome racial prejudice in order to prove to the world that she deserved to become the first African American woman to receive a PhD in chemical engineering. During her career in corporate America she was the first to design a pilot plant for supercritical fuel extraction and became a research manger of the first fundamental research engineering group of another corporation. The editors of African American National Biography (AANB) indexed all scientists and engineers under the heading of technology. Ms Brown extracted the list of chemists and chemical engineers from this list and created an index for use by other chemists (see below). Ms Brown is one of the chemists whose biographies appear in AANB. Ms Brown’s contribution to AANB is her first publication her project of documenting the history of African American women chemists. She has given numerous lectures and talks about her research and she is in the process of writing a book about these remarkable women. Her book will become a reference book which will put the lives of these women in one volume for use by students of the history of science, African American history and womens history. Ms Brown has also taken on a new task by becoming the historian of the American Chemical Society’s Women Chemist Committee.